I had my concert/prayer service last night. It went well and I was able to sell some CDs, which is good. As of today we have secured ourselves a 2 bedroom apartment in Pasadena. It's in the intentional community called "Allelous." The commitment basically involves sharing four evening meals per week with the 30+ other residents. We have a going away pot luck on Sunday, July 10th. That's about it for now. We have maybe two weeks until we begin our trek across the country. We plan to take about six days, driving 8 hours or less per day. A chapter in our lives is coming to a close, which makes us sad. We will be missing a lot of people. It will be exciting to see what God does in our lives next, though! 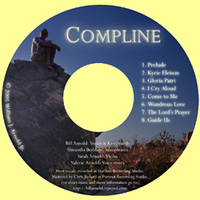 I am very pleased to announce that my CD is finally ready! Okay, it hasn't actually been duplicated and printed yet, but let's not split hairs. I have posted excerpts from all eight tracks on the left and have added a PayPal button so you can purchase your very own copy. They are $15, which will include shipping. If you buy lots of them maybe I can use the money to buy more software and equipment and start the process all over again! The total running time for the CD is 29:55. I've also posted lead sheets for all of the songs except for the prelude. You can download them all as a Word document. Anyway, I'm going to be intentional about the music I listen to while I run. This will keep me occupied and for a good cause. I'm going to try to keep at least one soundtrack album on my playlist at all times because of my interest in "composing to picture." Here's a little survey question for you: Who's your favorite film composer? One month until the big move! Our official move date is July 15th, although we may end up moving earlier that week. I will be flying in to LAX this Saturday morning. I have an interview and will be looking at apartments. If anyone that knows the area has some advice, let me know! I plan on blogging more regularly once school gets going. It will be a good opportunity to mull over and share what I will be learning. Should be great! Just finished my final mix of all 8 tracks for my CD. Now I will have at least one friend use his professional ears (as opposed to the ones he normally wears) to give me some pointers on making some changes here and there. He is also going to help me master the recording with a hardware doodad he owns. Meanwhile, I have scheduled a live performance of the material for June 26th at 6:30 p.m. If you are in, or near, North Jersey and would like to come, send me an e-mail and I'll give you directions. The live performance will be somewhat different as I will be using our church band to perform it. It will be fun, however, if I can extend some parts of it for solos, etc. Tony Jones, Doug Pagitt, Spencer Burke, Brian McLaren, Dan Kimball, Andrew Jones, and Chris Seay have written a collective response to critics of Emergent. Click here to read it.